I don't have a recent picture with her since she decided not to come back this year...so we'll just do with the old picture. I think this was 2 years ago? 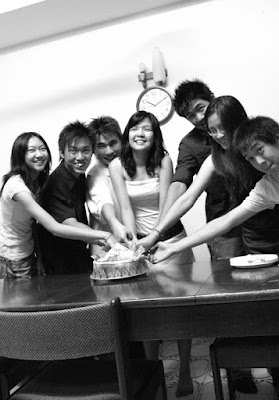 Drey, know that you'll always be dear to me whether or not your birthday is on the 1st, 2nd, 3rd, 4th or the 5th. I miss you heaps. <3 Happy 21st birthday! Oh and guess what someone bought back from Singapore? Of course he did not tapau the cooked one la. That's gonna be so bangas by the time it's here. Instead he brought back the special frozen packed meatballs with packets of gravy and the oh-so special jam for the meatballs. With three guys going crazy baking meatballs, boiling potatoes and making the gravy at approximately midnight, it was all good. 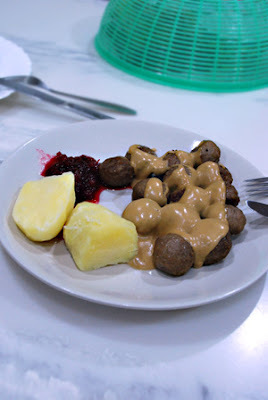 Swedish meatballs anyone?